I read Warrior Women through cover to cover in one go. 5***** Highly recommended Magnetic, magical and inspirational content resonated, so much that I contacted Liz and told her so! She is a Soul Sister, we are connected by Spirit. Why? Through experience we have discovered the route to our greatest riches and found what is truly important by overcoming or finding ways to deal with major challenges and adversity. 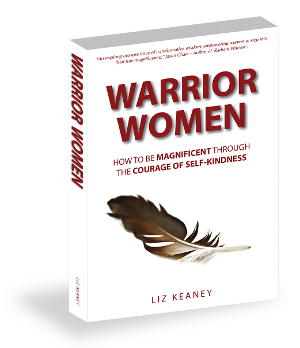 Featuring true stories of other Warrior Women you will connect with and The KindnessCODE to help you personally. Warrior Women is a powerful yet practical book. Many of the words are my words, used throughout my Entrepreneur Coaching and Mentoring career, helping women entrepreneurs who are stuck or blocked to design and then support them to implement their VitalVision Blueprint™ for the successful and holistic Life and Business they REALLY want. It is profound to think that when we don’t believe that we truly deserve what we want, that perfect life, then we will never ever allow ourselves to have it. Without belief it’s a case of self-sabotage our dreams or allow someone else to sabotage it for us. And that is why Belief (Faith) is such a powerful force for receiving and achieving! Warrior Women is for every woman today who sets impossibly high (or low) expectations of herself. Do yourself a big favour. Read Warrior Women, discover how other women overcame their challenges and embraced their transformations and begin to see how you can make life much easier on yourself while still being the ‘success’ you deserve. Journey into a deeper understanding and find your new way.